Featuring pro-audio quality overdrive, distortion and gain functions with high-cut control and unique L.E.D. interaction. This ultra-wide bandwidth pedal responds exactly like a tube without changing your tone and is unbelievably quiet. 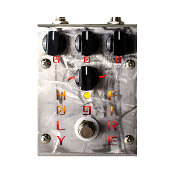 The Holy Fire 9 is a different approach to overdrive and distortion pedals. It's extremely responsive. Go from overdriven sounds to clean tones by rolling back the volume knob on your instrument. Retain your full tone spectrum, boost or cut your volume and dial in YOUR tone. Hand wired and built in the U.S.A.
9VDC 250mA power supply required. Manufacturer: Creation Audio Labs, Inc. Copyright © 2005-2019 Creation Audio Labs, Inc. All rights reserved.